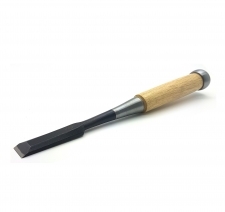 For those who desire the balance and functionality of a Japanese chisel without the price tag of their high end laminated cousins we have sourced these great value SK5 high carbon tool steel laminated chisels. SK5 is a high grade Japanese tool steel often used in the manufacture of quality knife blades, it offers easy sharpening with a good edge holding property at an exceptionally low price. The handles are from quality Japanese white oak and feature an iron back hoop to prevent splitting.